Yet another weekend has left me stunned and more inspired about this world I’ve chosen to live in. 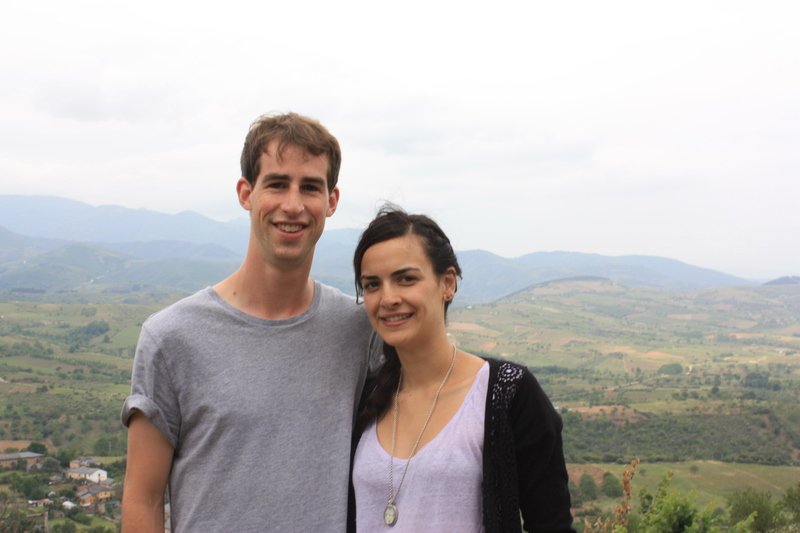 On Friday, and on a whim, Marta and I grabbed a last minute bus out of town up to Ponferrada where she is from. It’s been a place that I have heard about for the past two years living with her and I finally visited the place that she comes from. Of all the places I have visited in Spain, I think Ponfe must be the most meaningful place because even though it’s a world apart from anything I know, it’s the place that one of my best friends is from. And I’ve now finally seen it. On a normal weekend trip to a new city in Spain, I’m used to Spanish architecture, buildings, churches, cathedrals, bridges, and people. Normally, I feel a certain amount of excitement and awe, but in Ponferrada there was a strong new importance for me there. Every corner I turned, every cobbled street I walked on, and every square, park, or building that I passed, I imagined this person that I’ve gotten very close with wandering through its alleyways and paths as a child growing up there. I pictured my best friend playing games with her friends, spending time with her family, having parties down by the river, and just doing things that kids do. It was a heavy sense of nostalgia for a life I’m not a part of. This past Friday, I was feeling pretty under the weather with allergies or god knows what and even though Marta and I had planned on going to Ponferrada earlier in the week, I had opted out. But after class on Friday, I kept thinking about what I was going to that weekend and if I’d feel any better the following day. So I popped an advil and took a stroll through Madrid to see if my illness was something that could really hold me back, or if it was something that would pass with fresh air. So as I walked, I got this growing sense of regret that if I didn’t go, I’d be bored and miserable in my same old routine in Madrid dreaming of finally going to the town that Marta is from. Even though Marta said we’d go another time, I know that there won’t be another time since I’m leaving Madrid in just a few weeks. So despite the absence of my voice and the soreness of my throat, I told Marta that I was in. She bought our tickets and told me to be at the bus station at nine o’clock that afternoon. I hurriedly ran home from my stroll and packed my bags. We got to the station separately but with only about five minutes to spare. Marta surprised me: she had booked tickets for the Supra bus, which is the fancy, comfortable bus (yes, you pay a little bit extra) with food and drink services, bathroom, all the works. It was definitely worth the extra cash. During the five hour drive, Marta and I just chit-chatted about life and what we were going to see. She told me about the region that she is from, the city, and even tried to teach me their city’s song, which we would all sing with her friends later on that weekend. After a smooth trip, we had finally arrived to Ponferrada. We landed at a large park. Marta told me about when she was a kid and the day her mother finally let her cross the street and go to the park alone. Such a small goal to accomplish. But at the time it clearly had some large impact on her if she felt the need to tell me now so many years later. It made me think of when I was a kid and the big goals that I had accomplished. Maybe it was walking to middle school alone. Or finally getting my driver’s license. Or maybe it was staying up past 10pm. Now look where we’ve both come. In a nostalgia not of my own, I pictured little Marta bravely crossing the street and running through the park, and finally realizing that once she was there, it probably wasn’t nearly as exciting as she expected. Regardless, it’s something that stuck in her memory. So we crossed the famous gap (or simple zebra crossing) and arrived at her flat which lay opposite the park. We caught the lift to her floor and I finally met her parents. They were very sweet and inviting. Marta had warned me that this weekend I was definitely going to stand out as the “guiri” (white foreigner) but I was already preparing for that. I was also thrilled that I’d be having a very authentic Spanish experience staying there with her family, because in Madrid our lifestyle isn’t exactly traditional or typical of any country. Her parents gave me the upstairs bedroom, complete with bathroom, and I had it all to myself. Since it was already about 2 in the morning, we hit the hay for the night. Marta woke me with her laughter the next morning when she found me lying completely crooked in bed with my feet hanging off the end since I was a good two feet longer than the length of the bed. We ate breakfast and showered and then took to exploring this new world for me and an old, familiar, and safe one to Marta. She explained to me that the people in Ponferrada don’t talk so much about Ponfe, but rather about El Bierzo which is a concept that Marta had explained to me. The bierzo is this circular column of small mountains and overlying hills that surround the city. 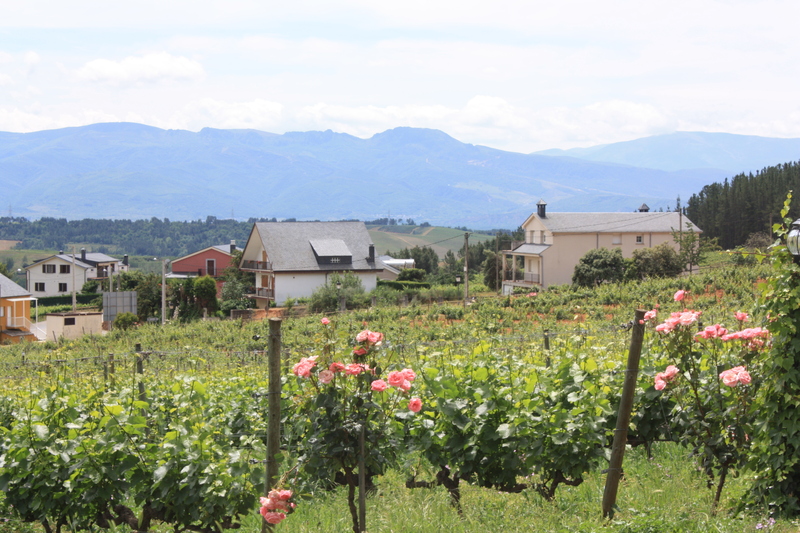 I guess there isn’t too much to see in the city, but all the gems lie outside in the bierzo. 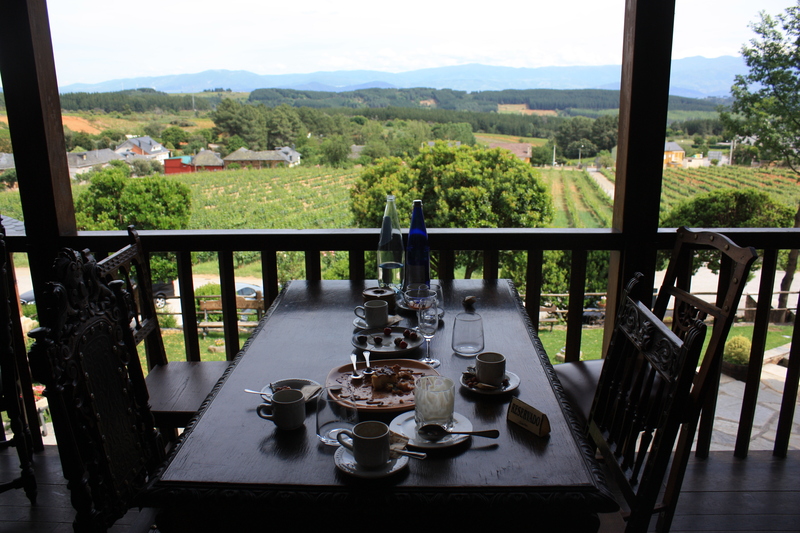 We went to a number of places that had spectacular views of the endless green hills, vineyards with grapes and orange colored cherries that were just ripening. 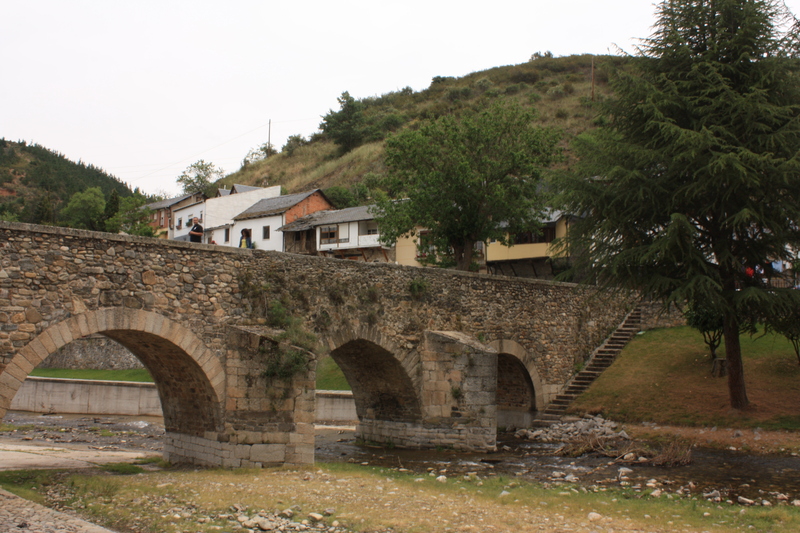 Later, I was taken to a tranquil place by the river that had an old roman bridge that went across picturesquely. I thought I was in an old Disney movie or something since it was so surreal seeing the mountain spring water flow underneath a bridge only Americans can dream of since our history doesn’t allow us any ancient marvels. There we ate Spanish salchicha and drank beer. Afterwards, we got lunch with la abuela, who was quite the character. I was quite taken aback when her grandmother joined us at the table with not just a glass of wine, but a filled-to-the-brim glass of calimotxo. Calimotxo is a drink for youngsters, for botellón. It’s a complete offense to the French and a must-have for any Spanish party; it’s a mixture of coca cola and red wine. This drink must have been made out of desperation when one night several years ago in Spain, when the beer was gone, the rum was dry, and all that was left was Coke and wine. So why not mix the two? In dire straights, desperate measures are taken. Although la abuela didn’t throw in Coke and opted out for the clear Aquarius, it still made me laugh at the fact that an older lady was relishing some somewhat disgusting concoction of Spanish youth. After our delicious Spanish lunch, and having la abuela practically force-feed me everything there was to eat, we went and got coffee with some of Marta’s friends. 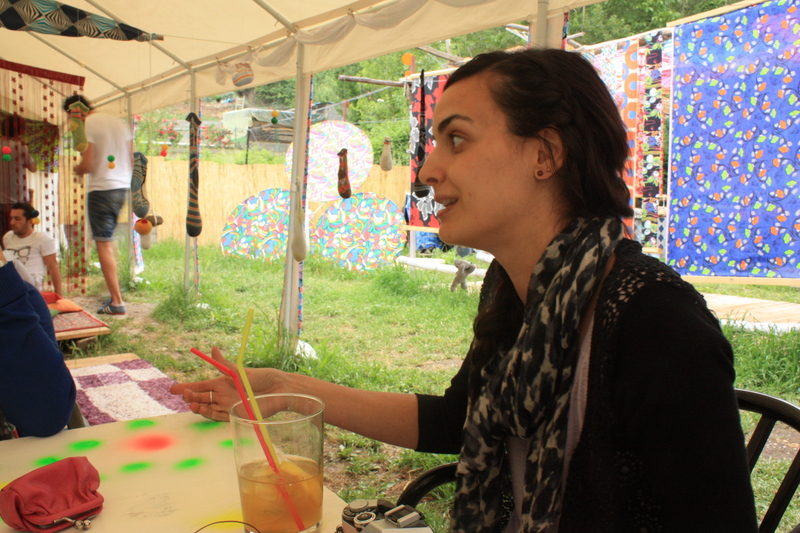 First we went to this hippy pad that was full of crazy art made from things you’d find in a dumpster. Then we went to a place that was quite the opposite. It was some barrel-shaped hovel in the ground on an old ranch with wild horses roaming in the grass right out front. After we had drunken our fill and the conversation started to run dry, we went home for a bit before going out. 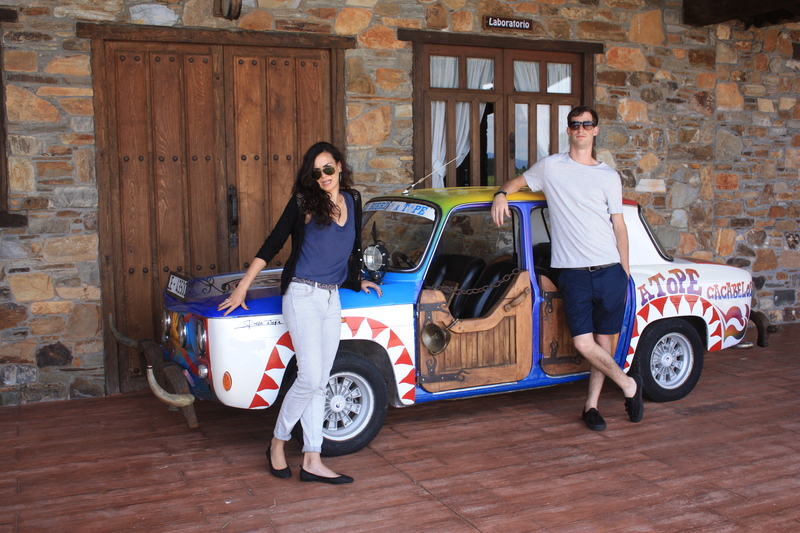 Marta and I took a trip through the Casco Antiguo (Old District) of her city. We stopped at a bar to grab a drink to kill time before we met up with all of her friends. Just when I thought Spanish beers couldn’t get any smaller, they did. Let me back up. In Madrid, everyone orders cañas. A caña is a beer in a small glass. It’s designed so that during the summer, your beer doesn’t go warm. When I first got to Spain I thought it was a joke. We Americans would never drink something so ridiculous and puny in size. But in Ponfe they had something even smaller: a corto. I went to pay and said that we had had two cañas and the guy quickly corrected me saying, “No, man. Those are cortos. They’re cheaper. You don’t want to pay for cañas, that’ll cost you more.” Fortunately he didn’t rip me off and was honest. Later on in the night I did order two cañas and in Ponfe, they were the size of normal beers. Just when you think you know Spanish, you go to another city and your world is flipped upside down. So we drank our cortos, then went to another place and ate spicy (anything spicy in Spain is a rare find) patatas bravas and drank cañas (remember: here, that’s a normal sized beer. I know it gets ridiculously confusing.) Marta’s sister, Ana, and her boy friend, David joined us. After we finished eating and drinking, we went to Ana’s surprise birthday where all of her friends were waiting. There, I met all of Marta and Ana’s childhood friends. It was a lot of fun eating great food, drinking wine (and Calimotxo), and just living a purely Spanish experience. These moments for me are some of the best. There was that instantaneous realization that you are a million miles from home, in the middle of some random pueblo, surrounded by great friends and the night is still young. You wonder how you even got there in the first place. The world just seems so enormous and then shrinks in on you so quickly that you’re almost breathless. I looked at Marta and just smiled for a moment and enjoyed that feeling of forever-ness and the feeling that you are so big and yet so incredibly small at the exact same time. But you are invincible. Once we got kicked out of the restaurant for singing Ponferrada’s hymn at two in the morning really loudly, we all went out. Just another night drinking and dancing with friends in Spain, in our traditional fashion. This aspect of Spanish life I know very well. Finally, around six in the morning, we stumbled on home and slept for the night. The following day, we woke and went out to eat with Marta’s parents and her sister. I was taken to one of the most beautiful places I had ever been to. It was some old caserón and bodega all in one place. Some old crazy guy that had some huge mutton chops and Elvis Presley sunglasses had made a killing by buying this place, gutting it, and restoring it. It was like some sort of ranch in this gorgeous house that had a restaurant, shop, and eight hotel rooms. 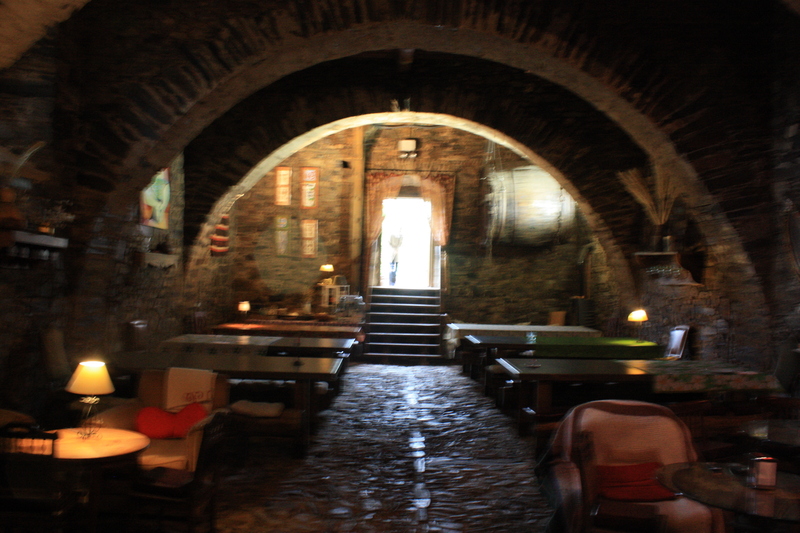 In the building next door, you could see where he made wine, champagne, and other things. The place sat on a green hill, surrounded by grape-lands and cherry fields. After Marta’s parents gave me the tour of the place and bit of the story about the crazy guy that built it, we got lunch. I left them all in charge of ordering. They got us all some of their favorite dishes that would be unheard of in the United States. I have to say that the cheeses and the meats were my favorites. Later, we were given cherries doused in aguardiente which is a strong alcohol. It’s the first thing I’ve eaten in a long time that I couldn’t swallow (okay, I did swallow, but I had to fight to get it down.) Marta’s father laughed and told me that I didn’t have to finish it. It was just too much for me. Needless to say, I’m glad I tried it. Marta’s parents were wonderful, and so was her sister. I wish her sister lived with us in Madrid too because she’s just as sweet and outgoing as Marta is. Her parents were so welcoming and I think they got a kick out of showing a foreigner all of the interesting things that there is to see out there in Ponfe. I sure enjoyed it. Again, I have to give Marta and her family the biggest thanks possible. It was terrific being able to go and stay with them for a weekend. And Marta being one of my absolute best friends here in Spain, it was such a long-awaited trip but totally worth the wait. I finally got to see where she comes from, and even though I don’t see her any differently now like she said I might, I feel like I understand her world better. I can’t imagine growing up where she did. It’s a place so surreal and stunning to me, and that’s where she gets to call home. I’m sure if she saw Colorado she would say the same thing though. On the bus ride home, we talked about what I thought of the trip and Ponferrada. I told her I adored her home city and her family. But we began talking about differences about where each of us has come from. It was one of those freeing and deep conversations that leaves you very pensive, but feeling good having talked with someone about something important. I told Marta more about Denver and where I come from. I emphasized to her that for me, some random kid from some random American city, having come to such a wonderful country and having visited such a beautiful town with a best friend who is so far from his origins is something unforgettable and unbelievable. I’ll never forget the trip and I’m already building up with a homesickness for a place that isn’t my own. So, again, thank you to Marta and to her generous family. They are all more than welcome in Denver whenever they are ready for their American immersion, just like my helping of a completely genuine Spanish experience. PS: Loving the new header. I love seeing where people come from. You mentioned cherries in aguardiente, which I’ve not had, but Mario’s father (my boyfriend’s father, that is) makes grapes in aguardiente, which I admit are difficult to get down! I’m not a big fan of aguardiente as it is!